Onesies, stuffed toys and that (usually childless) person who buys your unborn baby a pair of shoes that they realistically will never wear. Baby shower gifts are hard to get right. Mostly because in this day and age, you are already fairly prepared for bub – whether it’s first baby excitement or you’ve already had a baby and have tonnes of hand-me-downs that never got worn last time. Then there’s the somewhat embarrassing baby shower tradition of opening presents in front of everyone and cringing when someone inevitably goes over the top and makes your present pale in comparison. What did you think of how the gift was presented? My gift arrived in a big yellow tube with the contents hidden amid shredded paper. 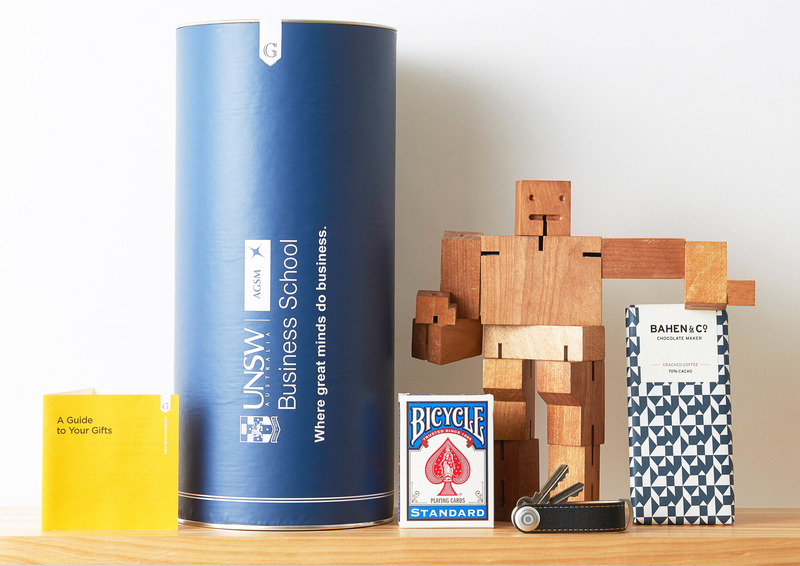 I’ve never received a gift presented like this before – it really is a unique, fun way of packaging gifts. What did you like about the contents of the Goods Tube? Awesome! Something for bub, something for me! 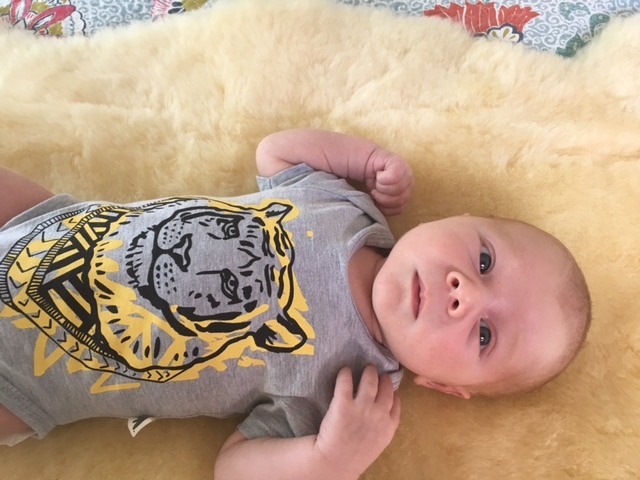 My newborn rocked in his beautifully soft, organic cotton grey bodysuit with a very cool tiger print on the front and his dry skin and red bottom welcomed the tube of organic soothing calendula cream which has been a miracle solution. And I appreciated the much needed sugar hit from the bar of handcrafted Toasted Sourdough Dark chocolate – it’s delicious and helps to combat the sleep deprivation. 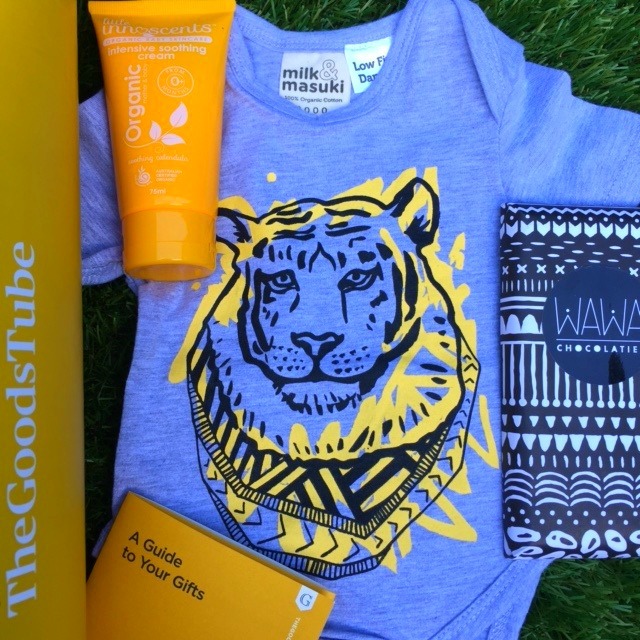 All the gifts tie in beautifully together…the yellow tube of soothing cream, the black and yellow print on the bodysuit and the black printed wrapper on the chocolate. What about the quality of the contents? You’re not going to find these products at your local shopping centre – they’re boutique brands that focus on quality and uniqueness and are designed or produced in Australia. How did it compare with other gifts you received? This gift was unique in every way; the packaging and the collection of products inside. Would you recommend the Goods Tube to others? Yes, for sure. When you’re looking for one-of-a-kind, quality products but don’t have time to scour the shops, this gift ticks all the boxes. How did you come up with the idea of the Goods Tube? One Christmas when my partner Joe was looking for client gifts for his architecture firm, we discovered that there was nothing that stood out in terms of design in the hamper gift market. Further the options available to personalise were not great. We couldn’t find anything that we felt was a good representation of the firm. We realised that in the corporate gift market there was a lot of focus on quantity over quality and price over true value. We have seen lots of examples of boxes and baskets full of things that you wouldn’t remember two hours later. The thing about quantity is that you forget the details and the story that each product comes with – or should come with. We live in a society now of people increasingly wanting to know where things come from, who made them and where. Design and stories definitely make your life better, and it makes things memorable, and so we decided to take it on and bring design and story telling to corporate gifting. With so many occasions us parents have to buy presents for, how can you make a gift unique and special? It’s the personal touch, I think. For kids’ birthday parties I often get the kids to draw and write the card to their friend and that is always really nice and gets them involved (+ it saves you $5-6 bucks on buying a card!). But also for gifts to adults I think the handwritten card is special and to include a hint about why you chose this thing for them or a hint about how you see them using the gift – to give a little insight into the thought process behind the choice, relating the gift to the recipient, can make the gift really special because that means you have really thought about the person you are giving it to. What would be in your ideal Goods Tube? My ideal Goods Tube tells a story that relates to the recipient. At the moment I am in a mode of taking the business to the next level at the same time as raising 3 children. And with all the energy that goes into that, I’m becoming aware that time is flying and I am not getting any younger! I have for many years, basically since we had our first child, not really taken time out to focus on myself. But now very recently I took on a personal trainer, and last week I went for an 1 1/2 hour massage for the first time in my life! On Sunday I read a magazine undisturbed, which was strange, and I even bought a new book to have on my bedside table and have managed to read a few pages (doesn’t take very long before my eyes start to go!) and so that’s where I am at. For those reasons, my ideal Goods Tube would be filled with some lovely pamper items like soap and nice smelling creams, perhaps a robe or something to lazy around in on a Sunday morning. Why the tube? Is this easier for people to send gifts long distance? It came from a design point of view. It is tall and elegant and stands out on a corporate desk, especially when it is branded. One of our branded tubes really packs a punch – no one will miss it! There is something special about the shape of a tube, it is different and we really wanted to create a vehicle for our gifts that was difficult to throw out. It is nice to hold and it has many potential functions afterwards. Our kids use them as drums, to put Lego inside or store tennis balls. We certainly send our gifts all over Australia so they have done some serious miles – oh the places they have gone! What is the hardest thing about starting your own business while being a mum? I think the sneaking feeling of stress and guilt of never being enough for everybody and everything is always a big one. And the lack of time to focus is another one. You don’t get many opportunities to truly just dwell on the business and let it consume you. I find I will just feel like I am starting to get into the zone and then suddenly it is pick up time! Having said that there are moments where I stop and look at the business and where it has come from and how it has grown, and I am really proud. I settle on the fact that growing a business and being a mum to three kids will always be a juggle, and a bit chaotic, and so be it! What have you learnt going into business that might help others thinking of doing the same? I threw myself into it not really knowing what sort of life would come out of it. The flexibility has been good but everything falls back on you. In the end the business and its outcomes is your responsibility and so there are also many times where you simply must be there and you can’t leave and you can’t go on holiday and you have to drag the kids along to the office sometimes on a Saturday and often it feels almost impossible to just let it go and enjoy the moment. But I guess what I’ve learnt is that you can do it. I was not an entrepreneur but have become one. And it’s not as romantic as it’s sometimes made out to be and it’s really important to be realistic about your goals and how much you can achieve when kids are on the scene, but it’s totally doable. So if you do have an idea and a dream then life is too short not to follow it. Don’t be the person looking back on life regretting never having given it a go! Take a look at the gorgeous Goods Tube gift ideas here.